I can’t believe it has been over a year since our trip to Europe. I so miss the days of walking everywhere, drinking wine & cappuccinos and eating ALL the pasta. My favorite part of the trip was a 5-hour private cooking class in Lucca, Italy – check out my brother’s travel blog for all the yummy details! When I am craving comfort food, my new go-to is the lemon cream sauce we learned to prepare. It’s light and perfect for summer. Today, I’m sharing it prepared two ways. The flavors in both of these recipes will blow you away… they certainly don’t taste healthy. Plus, both of these recipes can be made in 30 minutes, so it’s perfect for a quick weeknight dinner. Simmer the zest of 1 lemon in a tablespoon of butter or coconut oil for one minute on low heat. Then add 4 tablespoons of bone broth (or white wine). I always have bone broth on hand and try to use it as much as possible… it’s a super-food that helps with digestion, supports our immune system, remineralizes our teeth, and is vital for our connective tissues (ligaments, joints). Simmer for another minute. Next, add 1 cup of organic heavy cream, the juice of half a lemon and a pinch of sea salt (I use pink Himalayan salt ). Bring to a low boil, whisking frequently, to reduce the cream. After 10 minutes, remove from heat and let it sit – it will continue to thicken as it cools. While the sauce is sitting, you can make the pasta. For a completely grain-free version, you can make “noodles” from squash & zucchini. I use this julienne peeler to make the veggie strings, but of course you can use a spiralizer if you’re fancy. Then, saute the “noodles” in a bit of olive/coconut oil over medium heat for a couple of minutes just until they are soft. Season with salt and toss with the warm sauce. Complete the meal by topping with sliced organic Italian chicken sausage for some protein. Despite the fact that so many people are having problems with the gluten in modern wheat today, not all gluten is actually bad. Societies have eaten wheat for the centuries and been entirely healthy… even Jesus broke bread! Over the years, wheat has been hybridized to increase crop yield and is now high in they type of gluten to which most of us are intolerant. There is an ancient version of wheat that remains unhybridized and contains a completely different, more digestible version of gluten. This is the traditional wheat that our ancestors ate and were nourished by. Many with gluten allergies & intolerances are even able to eat Einkorn wheat without reaction. Read more here. Anytime I want to enjoy real pasta, I make Einkorn pasta . I buy mine at Whole Foods or Natural Grocers and it’s prepared just like any other pasta. 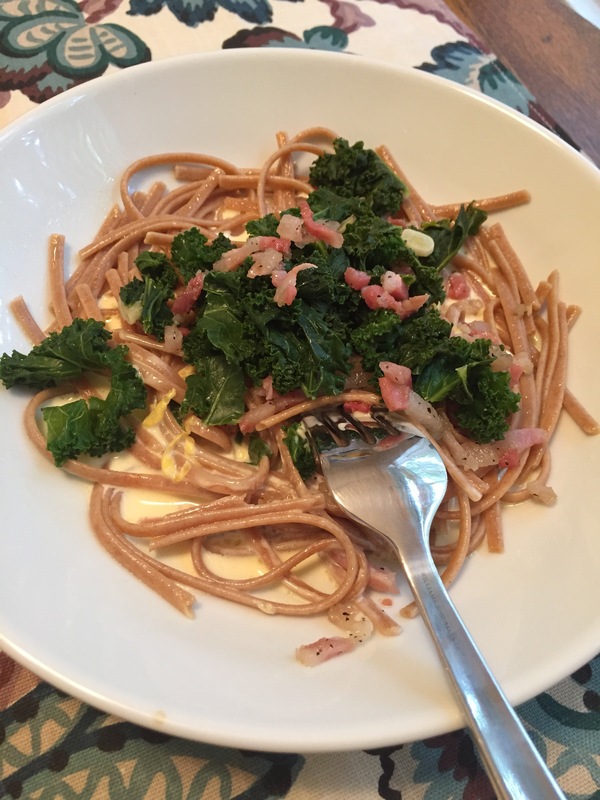 To complete this meal, I saute sliced pancetta (or turkey bacon) and kale, then toss with the pasta and lemon cream sauce.